"This is a common question among pilots and in fact, there is no such thing as an OK nick or dent in the propeller. A propeller is one of the most highly stressed components on an aircraft. During normal operation, 10 to 25 tons of centrifugal force is pulling the blades from the hub while the blades are bending and flexing due to thrust and torque loads. A properly maintained propeller is designed to perform normally under these loads, but when propeller components are damaged by corrosion, stone nicks, ground strikes etc., an additional unintended stress concentration is imposed and the margin of safety may not be adequate. According to the FAA all nicks are potential crack starters. This small scale damage tends to concentrate stress in the affected area and eventually, this high stress area may develop a crack. As the crack propagates, the stress becomes increasingly concentrated, increasing the crack growth. This growing crack can result in blade failure. What this means to us as pilots is that any nicks, dents, gouges or cracks are cause for a more thorough inspection by an A & P mechanic. In many cases this damage can be repaired quite easily if it is minor, but you must get the propeller inspected and/or repaired prior to flight. 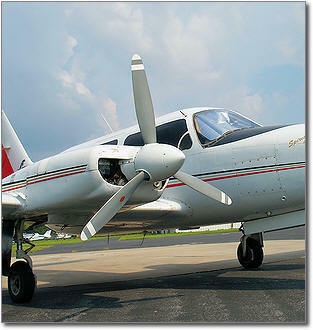 Flying the plane with even minor propeller damage can start that crack that could cause failure on a subsequent flight. So preflight that prop like your life depends on it because it very well could."